The James Sedgwick episode. 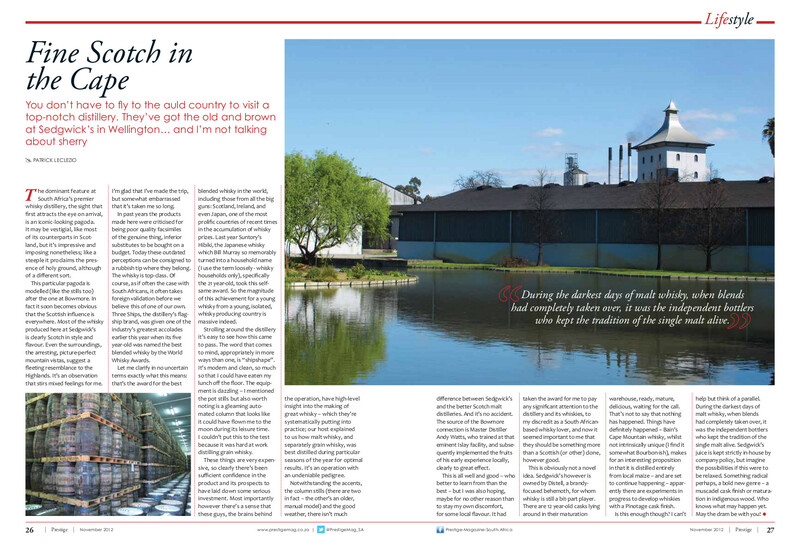 You don’t have to fly to the auld country to visit a top-notch distillery. They’ve got the old and brown at Sedgwick’s in Wellington…and I’m not talking about sherry. PS: The title in the printed version is not mine. I wouldn’t refer to whisky made in SA as Scotch, even jokingly. The dominant feature at South Africa’s premier whisky distillery, the sight that first attracts the eye on arrival, is an iconic-looking pagoda. It may be vestigial, like most of its counterparts in Scotland, but it’s impressive and imposing nonetheless; like a steeple it proclaims the presence of holy ground, although of a different sort. This particular pagoda is modelled (like the stills too) after the one at Bowmore. In fact it soon becomes obvious that the Scottish influence is everywhere. Most of the whisky produced here at Sedgwick’s is clearly Scotch in style and flavour. Even the surroundings, the arresting, picture-perfect mountain vistas, suggest a fleeting resemblance to the Highlands. It’s an observation that stirs mixed feelings for me. I’m glad that I’ve made the trip, but somewhat embarrassed that it’s taken me so long. In past years the products made here were criticised for being poor quality facsimiles of the genuine thing, inferior substitutes to be bought on a budget. Today these outdated perceptions can be consigned to a rubbish tip where they belong. The whisky is top-class. Of course, as if often the case with South Africans, it often takes foreign validation before we believe this of one of our own. Three Ships, the distillery’s flagship brand, was given one of the industry’s greatest accolades earlier this year when its 5 year-old was named the best blended whisky by the World Whisky Awards. Let me clarify in no uncertain terms exactly what this means: that’s the award for the best blended whisky in the world, including those from all the big guns: Scotland, Ireland, and even Japan, one of the most prolific countries of recent times in the accumulation of whisky prizes. Last year Suntory’s Hibiki, the Japanese whisky which Bill Murray so memorably turned into a household name (I use the term loosely – whisky households only), specifically the 21 year-old, took this selfsame award. So the magnitude of this achievement for a young whisky from a young, isolated, whisky producing country is massive indeed. Strolling around the distillery it’s easy to see how this came to pass. The word that comes to mind, appropriately in more ways than one, is “shipshape”. It’s modern and clean, so much so that I could have eaten my lunch off the floor. The equipment is dazzling – I mentioned the pot stills but also worth noting is a gleaming automated column that looks like it could have flown me to the moon during its leisure time. I couldn’t put this to the test because it was hard at work distilling grain whisky. These buggers are very expensive, so clearly there’s been sufficient confidence in the product and its prospects to have laid down some serious investment. Most importantly however there’s a sense that these guys, the brains behind the operation, have high-level insight into the making of great whisky – which they’re systematically putting into practice; our host explained to us how malt whisky, and separately grain whisky, was best distilled during particular seasons of the year for optimal results. It’s an operation with an undeniable pedigree. Notwithstanding the accents, the column stills (there are two in fact – the other’s an older, manual model) and the good weather, there isn’t much difference between Sedgwick’s and the better Scotch malt distilleries. And it’s no accident. The source of the Bowmore connection is Master Distiller Andy Watts, who trained at that eminent Islay facility, and subsequently implemented the fruits of his early experience locally, clearly to great effect. This is all well and good – who better to learn from than the best – but I was also hoping, maybe for no other reason than to stay my own discomfort, for some local flavour. It had taken the award for me to pay any significant attention to the distillery and its whiskies, to my discredit as a South Africa-based whisky lover, and now it seemed important to me that they should be something more than a Scottish (or other) clone, however good. This is obviously not a novel idea. Sedgwick’s however is owned by Distell, a brandy-focused behemoth, for whom whisky is still a bit-part player. There are twelve year-old casks lying around in their maturation warehouse, ready, mature, delicious, waiting for the call. That’s not to say that nothing has happened. Things have definitely happened – Bain’s Cape Mountain whisky, whilst not intrinsically unique (I find it somewhat bourbon-ish), makes for an interesting proposition in that it is distilled entirely from local maize – and are set to continue happening – apparently there are experiments in progress to develop whiskies with a Pinotage cask finish. Is this enough though? I can’t help but think of a parallel. During the darkest days of malt whisky, when blends had completely taken over, it was the independent bottlers who kept the tradition of the single malt alive. Sedgwick’s juice is kept strictly in-house by company policy, but imagine the possibilities if this were to be relaxed. Something radical perhaps, a bold new genre – a muscadel cask finish or maturation in indigenous wood. Who knows what may happen yet. May the dram be with you! This entry was posted in Whisky column and tagged Bain's Cape Mountain Whisky, James Sedgwick Distillery, Three Ships, Whiskey, Whisky. Bookmark the permalink.